Here is an article from the NYT about Daoist music at Carnege Hall. 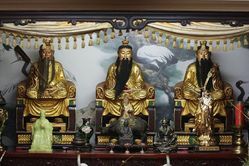 Here is an article from Taiwan News titled Daoism in Taiwan Undergoes Transformation. I personally found the article frustrating. It starts off saying Daoism is the hot new thing, then tells us it was hot a long time ago, then it says it's always been kind'a hot under the radar, then is says it's gotten too hot is some ways. All true I guess but each point is only interesting if investigated in depth. This one is also from the Taiwan News about a Palanquin builder and carver who is competing with cheaper mass produced palanquins. This Summer I really enjoyed walking around the neighborhood they describe in the article. There were tons of people carving deities and the work was exquisite. (I got some of it on video too.) These articles about how a traditional skill is being lost are not that convincing. First of all, if it made it into the 21st Century, it's doing pretty good for itself. Seems like there is still a market. Second of all, if a mass produced one will do, then a mass produced one will do. What's the big deal? Take that incredible skill and carve something else that people want to buy and treasure. It's funny too. One of the key metaphors in the Daodejing is that of the Uncarved Block of Wood. Hey, leave that block of wood in a potential state, at least until you need it. It was recognized 2500 years ago that the process of carving wood expands the part of your mind dedicated to your arms, fingers and shoulders. Carving causes stress. It forces things into being. What would happen if we just left the gods inside the blocks of wood? Would we still be human?